1. Hypercornification – Oily skin or dead skin cells which ends up clogging the opening of the oil glands. This leads to accumulation of sebum in the sebaceous glands (oil glands). 2. P.acne – The bacteria which is implicated in the causation of acne. This bacteria is anaerobic, i.e. it enjoys an environment which is low in oxygen and is created by the heaped up dead skin cells and the sebaceous secretion. 3. Inflammation – This precedes or occurs post the action of P.acnes. This leads to the formation of whiteheads, blackheads, papules, pustules, nodules and cysts. 4. Increased oil gland secretion / sebaceous gland secretion. Acne can lead to psychological distress and scarring which is why it is important to treat it early and in the right way. Our skin specialists at Dr. Kandhari’s Skin Clinic suggest specialized treatments particularly based on the type of your skin and acne so as to provide you a clear acne-free skin. The treatment chosen for a patient depends on the severity of acne for e.g. 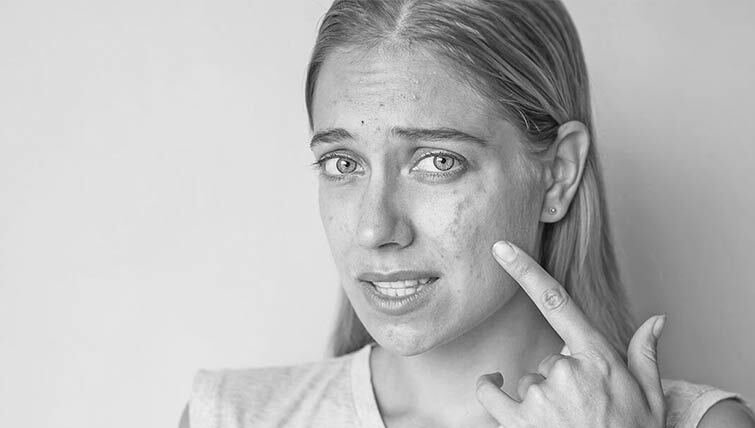 mild acne can be treated with the help of topical medication (face wash and creams) while severe acne might need further medical attention (oral medication and investigations). Making significant lifestyle changes as suggested by your dermatologist can also be helpful in reducing the appearance of acne.